You know that it’s going to be a sizzling summer. You also know that you have a toddler who simply loves playing with water. Or maybe it’s you who loves water and you want your toddler to develop a love for water too! Or perhaps you have a toddler who is simply terrified of water. Maybe your toddler hates baths and won’t even venture to let his or her toes get wet at all. Not all toddlers are going to naturally love water but as a parent, caregiver or guardian, it’s a good idea to encourage your toddler to love water, or at least, not be afraid of it. It makes a lot of sense to help your toddler to love water…or at least, be comfortable (and wise) around water. Why is this important? We know of toddlers who simply hate bath time because they don’t like their faces getting wet. It can be completely draining to have to convince a strong-headed toddler to take a bath…especially if this is a daily battle. Learning to swim is an important life skill to have. It can literally save lives. We think that every parent should teach their kid to swim or if you can’t or don’t know how to do it, pay someone else to do it. Since our earth has mass areas of water, your child is probably going to eventually come to places where there are lots of water. For example, homes with pools, camping trips located next to a lake etc. The more you know that your toddler can handle himself or herself safely around water, the less worried you will be. Last but not least, water play is simply a fun activity…especially for hot, summer days when all you want to do is sit in a cool waddling pool. If you help your toddler to develop a love for water, you can look forward to many fun activities including running through sprinklers, visiting splash parks, going down water slides and of course, swimming in toddler pools. The most important part of encouraging your toddler to love water is to have fun and make sure that YOU are comfortable around water yourself. Kids often take on our own feelings towards a particular activity. For example, if they see or sense our fear or dislike towards a particular object or activity, they are more likely going to adopt our feelings as their own. So show them how much fun water can be. 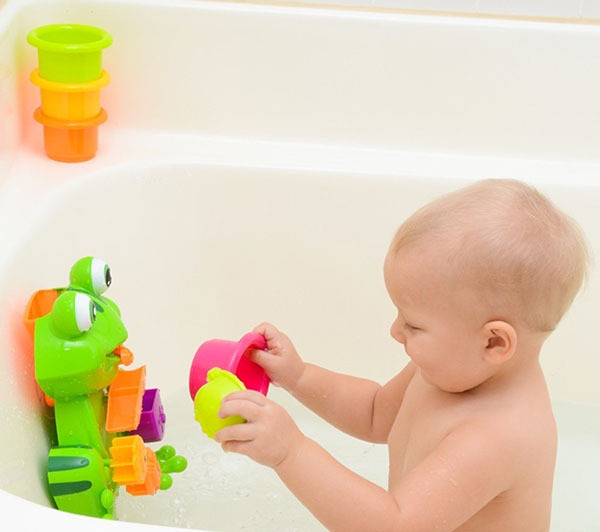 Get them some cool bath toys and play with them. Get wet yourself! If they refuse to get in the bath, start with a small bucket of water and let them play with the water in it, under your supervision. If they don’t like water on their face or hair, try making a game out of lightly sprinkling some water on their face with a bath toy that has tiny holes in them. Don’t force anything but keep it all light-hearted. Be prepared to change activities immediately (even after 1 minute) if you can see that they are getting too upset. On one hand, you want to encourage your toddler to love and be comfortable around water but drowning is a significant danger to toddlers. In the US, the statistics are pretty grim. According to the CDC, between 2005-2014, there were 3,536 unintentional drownings and one in five of these were children aged 14 years and younger. According to a report by the UK National Water Safety Forum, there were 10 children aged 4 and under who drowned in 2013 alone. Any single drowning is a tragedy. That’s why it’s important to supervise any young child around water. The most important rule is to NEVER leave them alone around a body of water by themselves. For example, even if the water is shallow, they could still accidentally slip in the bathtub and knock themselves unconscious. Make sure that you provide full attention to your toddler when there is any water around. It may be tempting to look at your smartphone while your toddler is playing in the bath but you should always have 100% full attention on your toddler. Fence any swimming pool. This is especially important for toddlers who are mobile and yet still don’t fully understand the dangers of water. If you around a body of water that cannot be fenced (such as a lake), make sure that your toddler is always within arm’s reach. Even if you don’t know whether your toddler fully understands you or not, it is a good idea to talk to your child about the need to be careful around water and its possible dangers. Model good behavior around water yourself by being confident, yet careful around water. Teach your child to swim or sign your child up for swimming lessons. There are quite a few that allow your children to start at around 6 months old but some start as early as 2 months old. Be aware that pool noodles and floats are not infallible. You still need to keep your child at arm’s length when he or she is in the water. Empty out bathtubs or buckets immediately after use. Ensure that toilet lids are locked down and doors to bathrooms are also closed. Take a CPR course. When you have a toddler, a first aid safety course is always going to be useful and most courses include a CPR session. Now that we have talked about some safety tips around water, it’s time to find some water toys that will help your toddler have fun with water play. Here are our 9 favorite Kids’ water toys. Toddlers just seem to gravitate naturally towards this water play table. It incorporates a spiral ball drop, a Ferris wheel that scoops and drops off balls and a twin water-powered wheel. 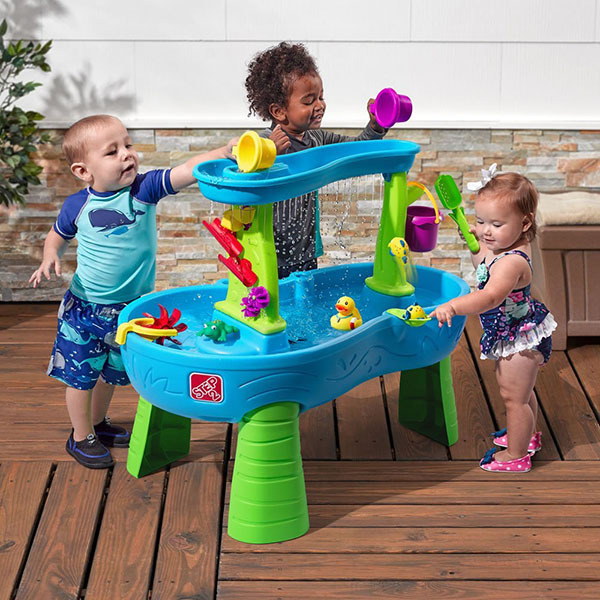 Not only is this water play table fantastic for helping toddlers develop a love for water but it’s also great as a water toy that builds social skills as several kids can play with this water table at the same time. 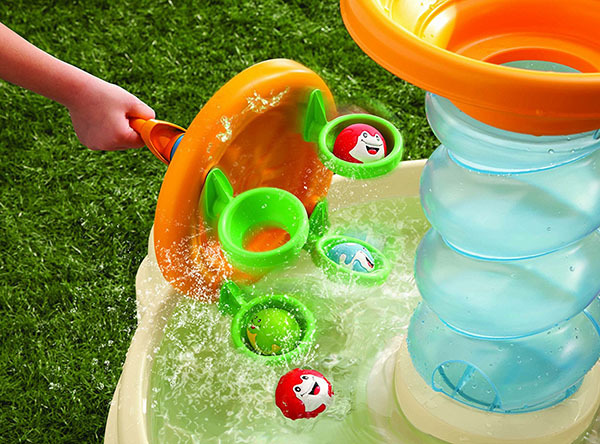 This water play table also comes with a water cup and 5 mini toys that squirt water. Setting this up is also pretty easy, which is a plus for parents. This is another fantastic water play table. It comes with an upper-level water deck that is about 34” tall and cool water ramps that create a waterfall-type effect. There are also 3 buckets for pouring water onto the ramps and multiple water maze pieces. There are also two toys that squirt water. This play set is designed so that several children can play together. There is also a convenient water plug that will make it much easier for you to drain the water our after play is finished. Set up is relatively straightforward. Totally makes sense that this toy was awarded the coveted title of Most Wanted 2017 Summer Toy! 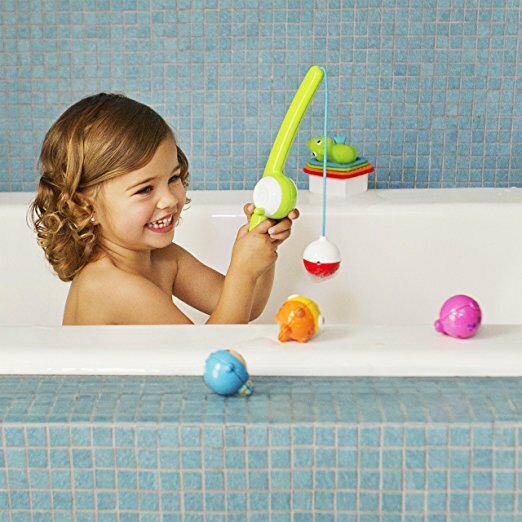 This Munchkin-Fishin’-Bath is great fishing fun for older toddlers. It comes with a magnetic fishing rod to pick up 3 cute-looking toys (fish, octopus and baby) that can float in water. The toys are air-tight so you don’t have to worry about mold and mildew collecting in them. It is also great for building hand-eye coordination and instilling patience in toddlers! Fantastic for use in the bath or in small containers of water. 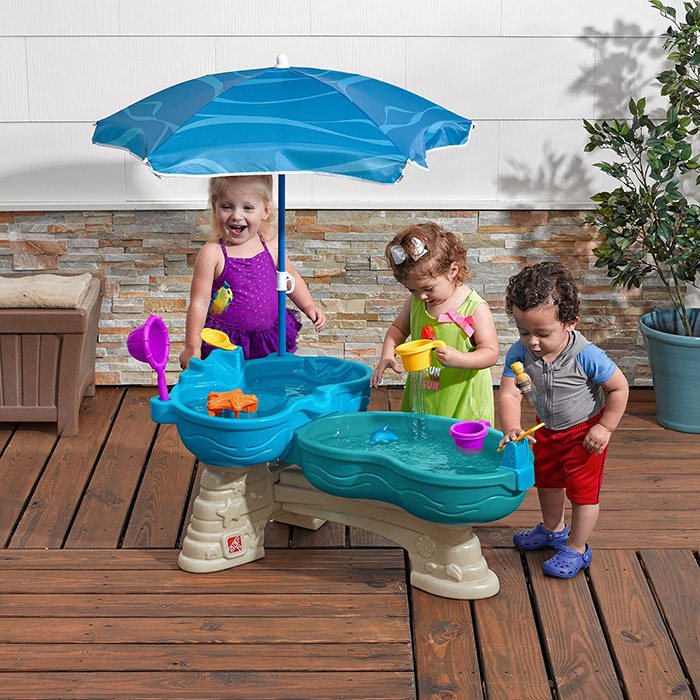 We like the Step2-Spill-Splash-Water-Table because it comes with a cute umbrella that provides some shade from the sun (trust us, it is worth paying extra money to get extra sun protection for your child). It also comes with 2 different play water pools. The upper water table holds 2.22 gallons of water and the lower holds 3.24 gallons. Due to its design, it is big enough to fit quite a few children around it. If you scoop enough water into the upper water table, your toddler can watch the water flow from the upper-level water table to the lower one. There is also a water spinner in the upper-level water table that your toddler can use to create a whirlpool. This water table also comes with 4 buckets and several cute figures including 2 divers, a dolphin that squirts water and a fish that also squirts water. There is also an attached diving board and a moving springboard/slide to add fun to this water table. If you want to, you can also add sand into this water table. Set up is not too difficult but be warned, you will need to use a drill for the screw holes. This is a cute simple-looking toy that is tons of fun. This penguin swims through water when you wind up its arms and release it. It’s not an expensive toy but it is pretty interesting watching the penguin swim around. The manufacturer also says that the paint on it is non-toxic. This is an award winning bath toy that uses gravity and the flow of water to make the frog move. The frog wears a bow tie that holds water and this water gets poured out when it gets too full into moving Ferris wheels. Great for learning about cause and effect and hand-eye coordination. This toy also comes with 4 stacking cups so that your toddler can have lots of pouring fun! The stacking cups have a tiny hole in them so that you can use them to sprinkle water on your toddler’s face. As mentioned before, this is a great strategy to employ if you have a toddler who hates water on his or her face. This toy suctions onto the bathtub and bath wall and also comes with a lifetime warranty. 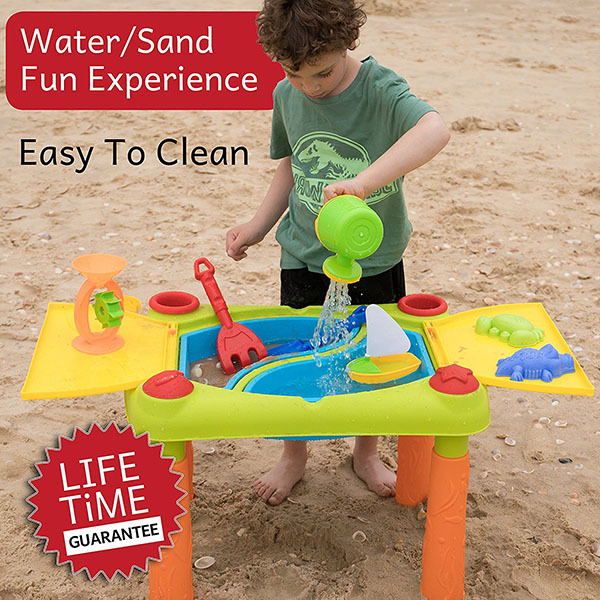 This sand water table comes with lids that fold out to provide more play space. It can be used with water alone, sand alone, or as a combo of both which makes it pretty exceptional. It comes with fun supplementary toys such as sand buckets, shape molds, a rake, a shovel, a watering can, a boat and a water wheel. As a parent or caregiver, you may be worried about the ease of cleaning out this table if it gets all sandy. The great news is that the basins are removable so that you can simply rinse it out. The legs are movable and the lids of the table fold back on either side so that you can transport it more easily with you. Great for building fine motor skills, as well as a love for water! This set also comes with a free water gun and ebook and it comes with a lifetime guarantee. This is another great toy for bath times. It has a turning roulette wheel and waterwheel that rotates when you pour water through it using the 2 stackable cups that are provided. When water travels through the toy, it also creates a waterfall effect. The fan and turbine spin and there is a cute robot-looking face whose eyes roll when water flows through this toy. Again, a great toy for developing hand-eye coordination. The toy is made of eco-friendly ABS plastic that is non-toxic. This is one of the most fun water toys on our list. If your toddler is a water baby and wants to play in water every day, rather than making a drive to the swimming pool or beach on a daily basis, you could get this Intex-Rainbow-Ring-Inflatable-Play. 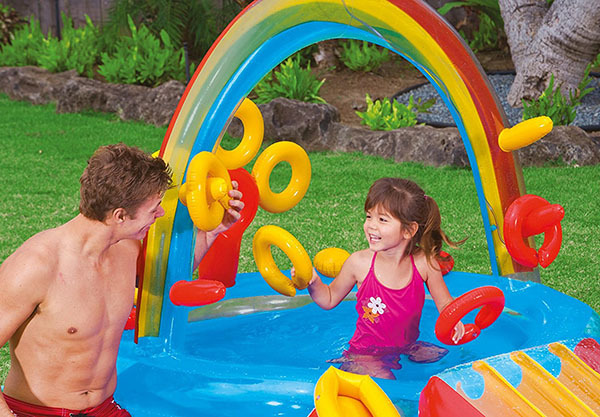 This inflatable mini pool comes with a rainbow archway that sprinkles water. There is also a mini slide. How super fun, right? To add to the existing fun, this play center also comes with mini inflatable rings that your toddler can throw onto hooks attached to the rainbow. If your toddler is not quite that skillful yet, the mini rings provide independent play in the pool itself. This play center is big enough for about 5 toddlers to play in it all at the same time. Best of all, if it gets too cold outside, you can transform this play center into a mini ball pit. We hope that you have an amazing, watery summer! Stay safe and have lots of fun.